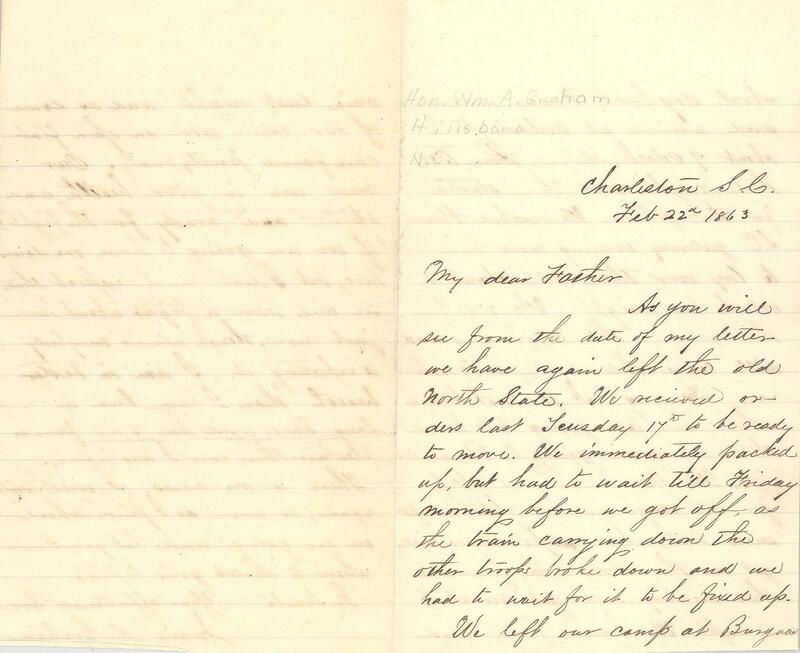 Item description: Letter, 22 February 1863, from James A. Graham, officer in the “Orange Guard,” Company G, 27th Regiment N.C. Troops, to his father William A. Graham. Item citation: From the William A. Graham Papers #285, Southern Historical Collection, Wilson Library, University of North Carolina at Chapel Hill. As you will see from the date of my letter we have again left the old North State. We received orders last Tuesday 17th to be ready to move. We immediately packed up, but had to wait till Friday morning before we got off, as the train carrying down the other troops broke down and we had to wait for it to be fixed up. We left our camp at Burgaw about daybreak Friday morning and arrived at Wilmington about 9′ oclock, stayed there till that night and then started for this place. We reached Florence, S.C. yesterday evening and had to lay over there till about 1 o’clock last night. We reached this place this morning and will leave this evening or tomorrow morning. I do not know where we are going, but heard that we were going to Pocataligo. We have had no sleep for two days and nights, except such little short naps as we could get on the cars, and if we start this evening will get no sleep tonight. We had a pretty hard rain last night and, as some of our men were on open flat cars, fared pretty badly. 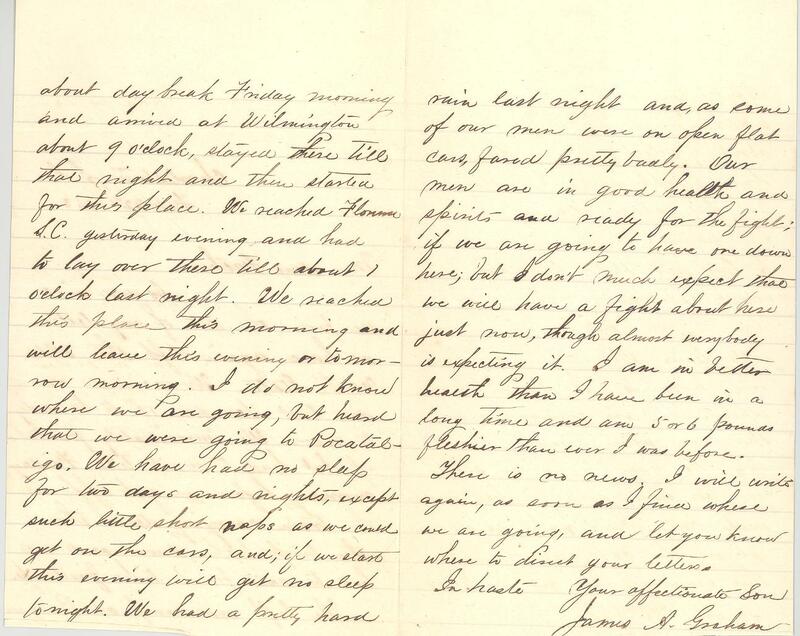 Our men are in good health and spirits and ready for the fight; if we are going to have one down here; but I don’t much expect that we will have a fight about here just now, though almost everybody is expecting it. I am in better health than I have been in a long time and am 5 or 6 pounds fleshier than ever I was before. There is no news. I will write again, as soon as I find where we are going, and let you know where to direct your letters. This entry was posted in Southern Historical Collection and tagged 27th North Carolina Infantry Regiment, Graham family, James A. Graham, North Carolina, Orange Guards, William A. Graham. Bookmark the permalink.